Over the last few days, we have been privileged to visit some of the most amazing places on the face of the earth….I thought I’d share a few observations and tales…. 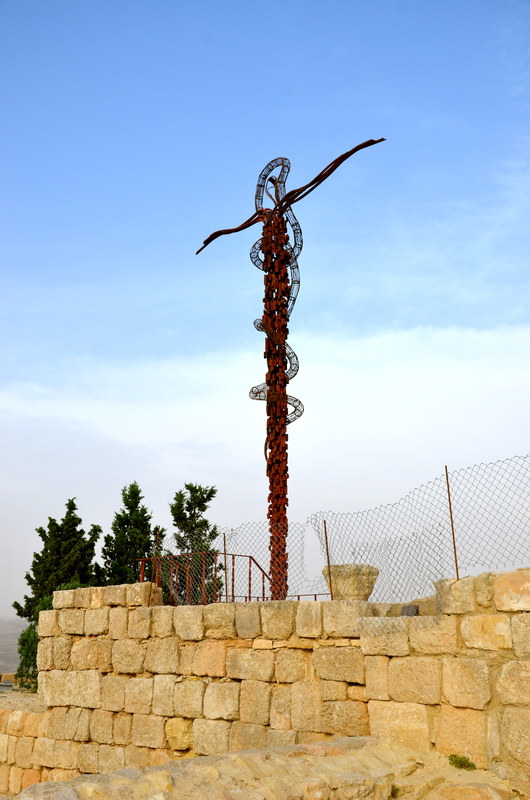 Mount Nebo is one of the most revered holy sites of Jordan and the place where Moses was buried. A small Byzantine church was built there by early Christians, which has been expanded into a vast complex. During his visit to Jordan in 2000, the Late Pope John Paul II held a sermon here that was attended by some 20,000 faithful. On the highest point of the mountain, Syagha, the remains of a church and monastery were discovered in 1933. 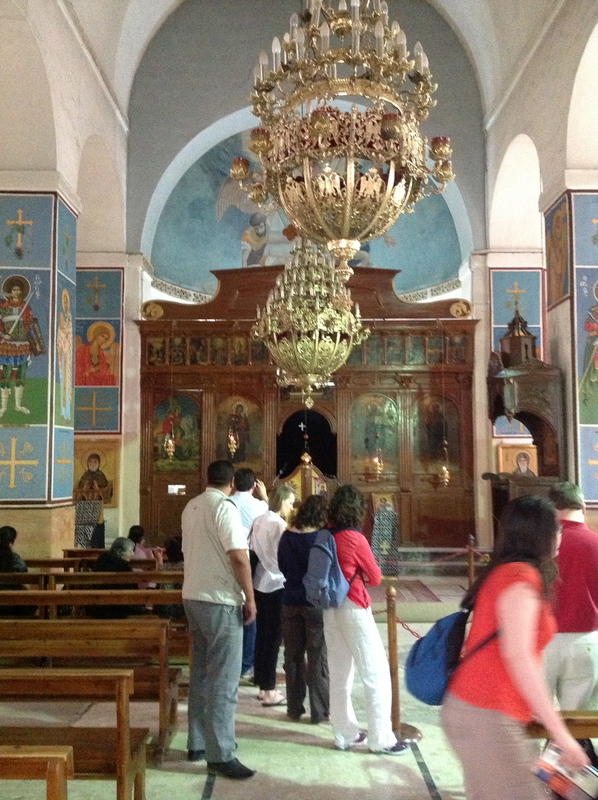 The church was first constructed in the second half of the 4th century to commemorate the place of Moses’ death. We were running late this day and decided to still go to the site. Unfortunately, the church is under renovation, so we could not enter. But we did head to the place where Moses was allowed to view the holy land and where God showed Moses the promised land and explained that he would not join those he had led from Egypt. The weather did not fully cooperate either, but I am told that when you stand where I was standing – and it’s a clear day – you can see, as Moses did, the Jordan River Valley, the Dead Sea, Jericho and Jerusalem. We were able to see some things in the distance; however, dust and wind prevented it from being a clear vista. Nevertheless, I was tremendously moved by standing in this place. 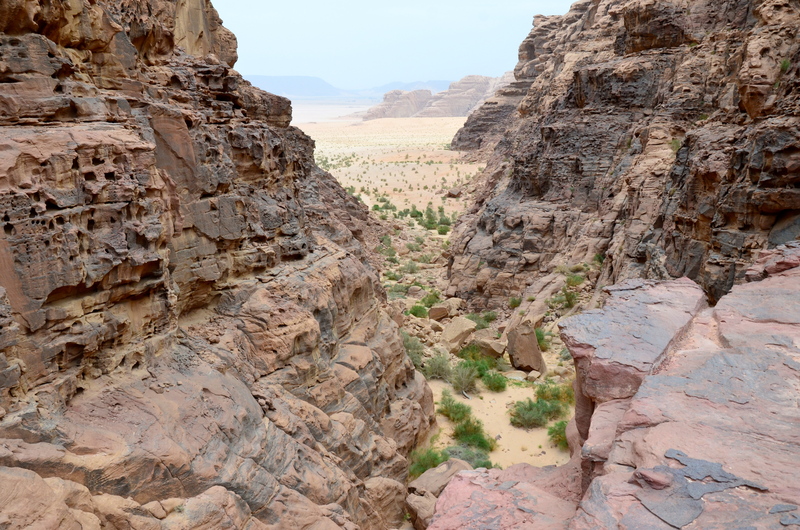 Jordan’s rich and treasured historic monuments are unlike any I have visited before. This is a place where as you walk, climb, hike, or just visit the valleys, hills and plains of this country, the names of famous historical and Biblical persons, who have been woven into our collective human history by virtue of walking in these same places and crossing its rivers during their lives, are virtually everywhere. As I walked back to the bus, I quietly reflected upon what this pilgrimage meant to me. And all I could think of was that when God chose Moses to lead the people of Israel out of slavery in Egypt, Moses was unwilling at first. And after I got beyond the “Oh my God, I’m standing where Moses stood,” phase, I started to think about how many of us are reluctant to get up and do something even when God clearly has something else in store. 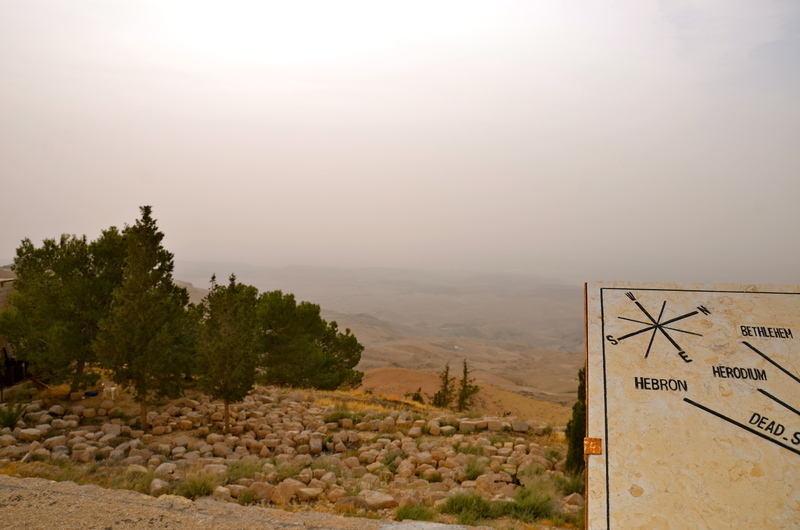 Visiting Mount Nebo was a reminder that when we feel that tug from inside, we need to listen because we don’t always know what God is trying to tell us to do. 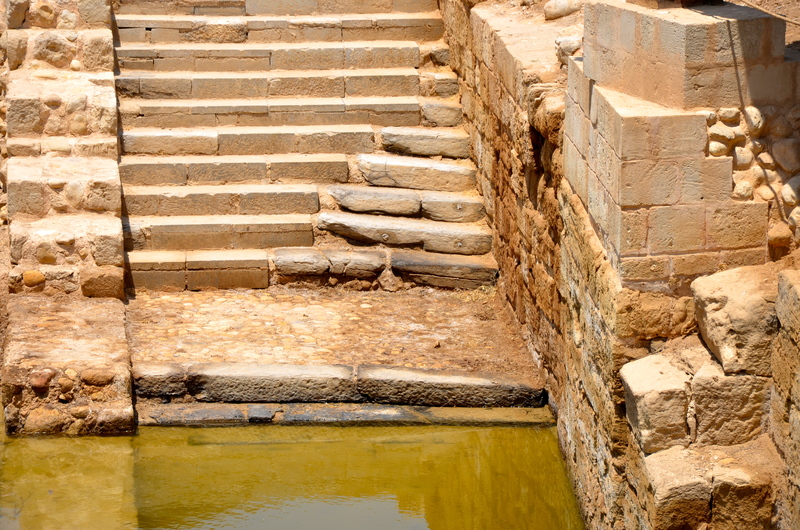 For anyone fascinated with history, a visit to Jordan is a must. But for Rome itself, I’m not sure I have ever seen so many wonderful examples of ancient ruins than in Jordan. 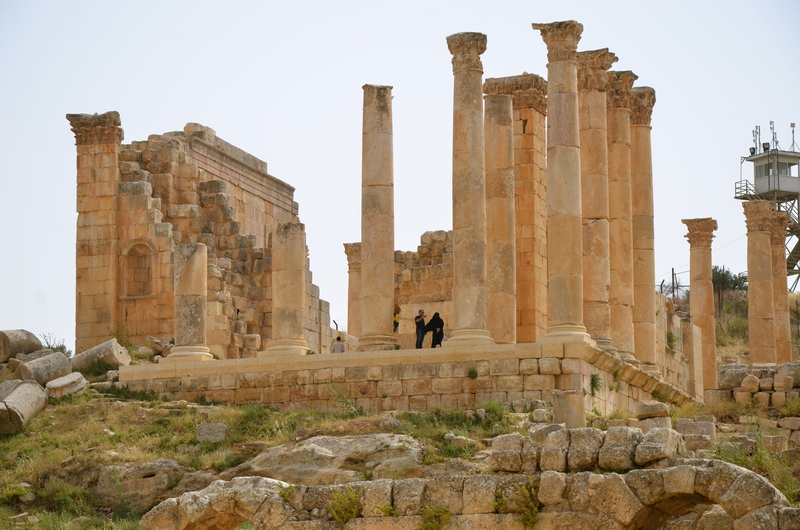 On Thursday, we visited the ancient city of Jerash. Jerash is the site of the ruins of the Greco-Roman city of Gerasa, also referred to as Antioch on the Golden River. 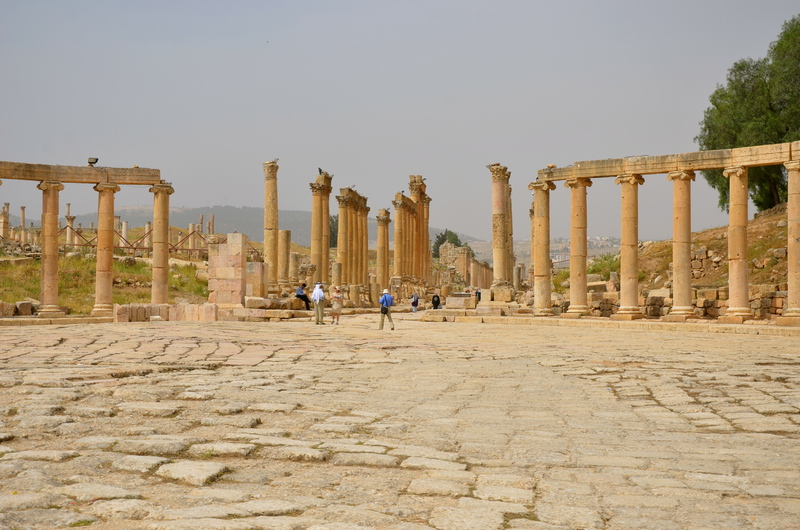 Visiting Jerash is without a doubt one of the best preserved Roman cities I have ever seen, and sadly, I had never heard of it before this trip. 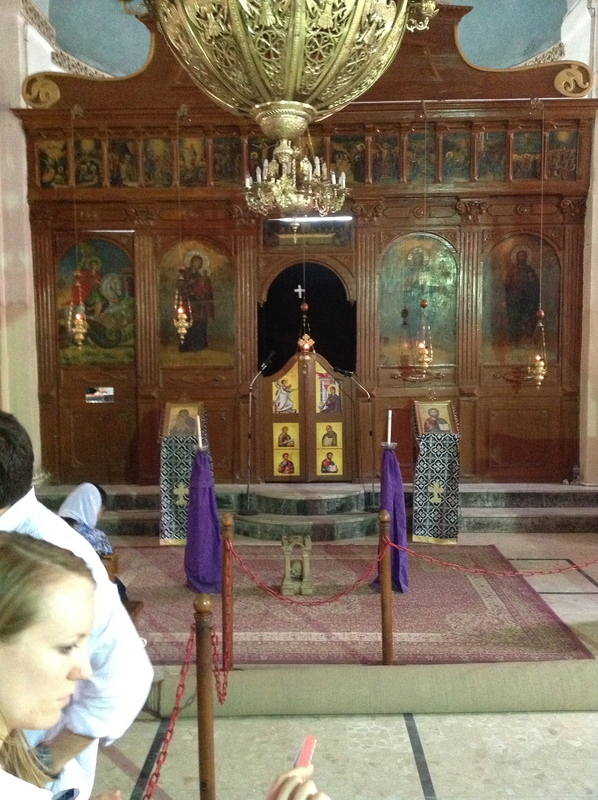 After visiting Jerash and Mount Nebo, our final stop of day was a trip into Madaba. 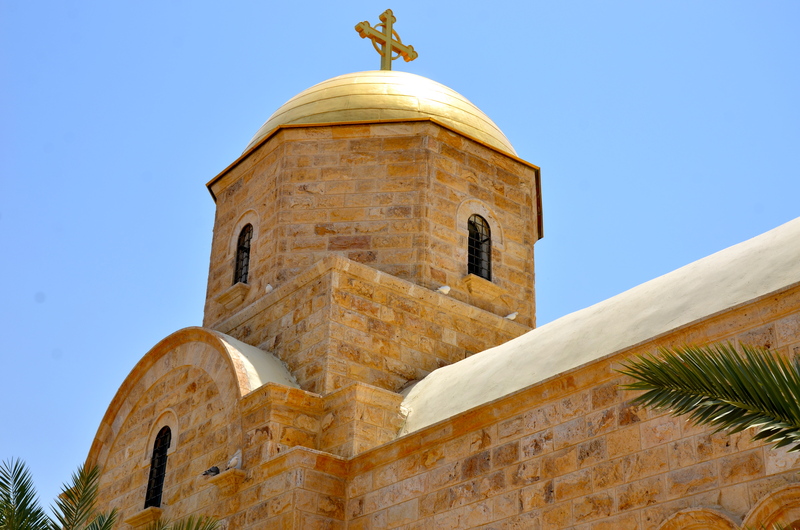 The city of Madaba is known for its mosaics and religious sites like St. George’s Church. 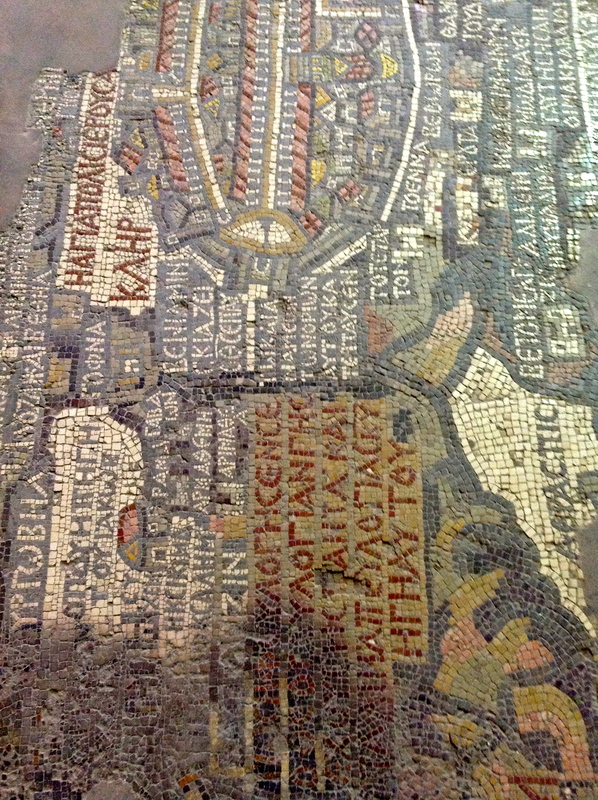 on the original floor of St. George’s church are the remnants of church’s mosaic map of the Holy Land. 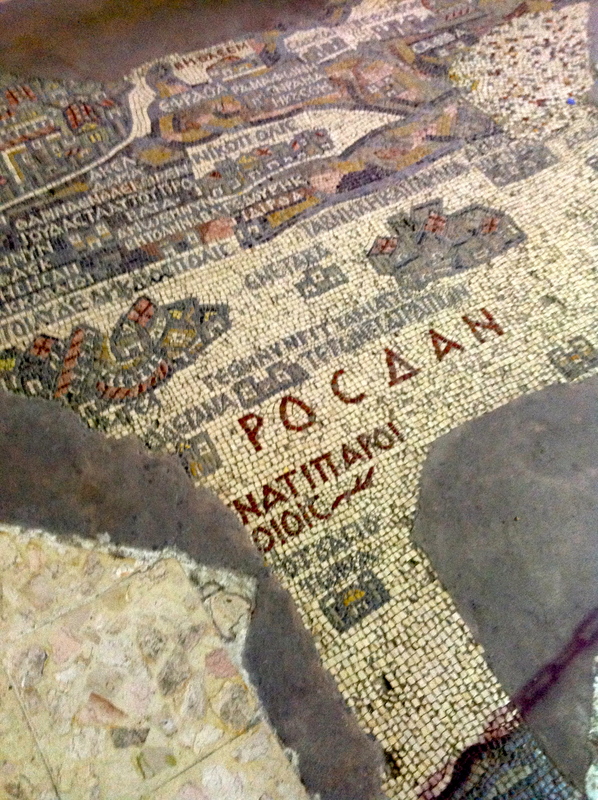 The Map of Madaba mosaic was discovered in 1896 and the findings were published a year later. But the amazing thing about the Madaba Mosaic Map is that it is an index map of the region, dating from the 6th century! 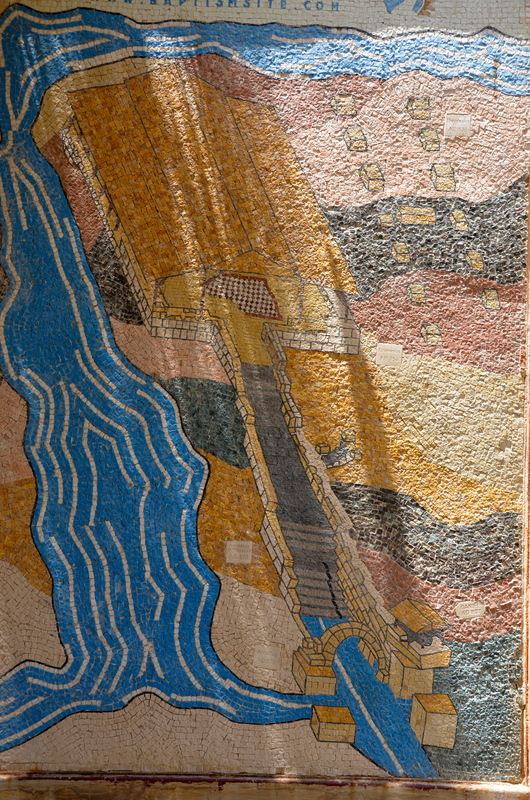 With two million pieces of colored stone, the map depicts hills and valleys, villages and towns in Palestine and the Nile Delta. The mosaic contains the earliest extant representation of Byzantine Jerusalem, labeled the “Holy City.” The map provides important details as to its 6th-century landmarks and is one key in developing scholarly knowledge about the physical layout of Jerusalem after its destruction and rebuilding in 70 AD. The actual map depicts an area from Lebanon in the north to the Nile Delta in the south, and from the Mediterranean Sea in the west to the Eastern Desert. 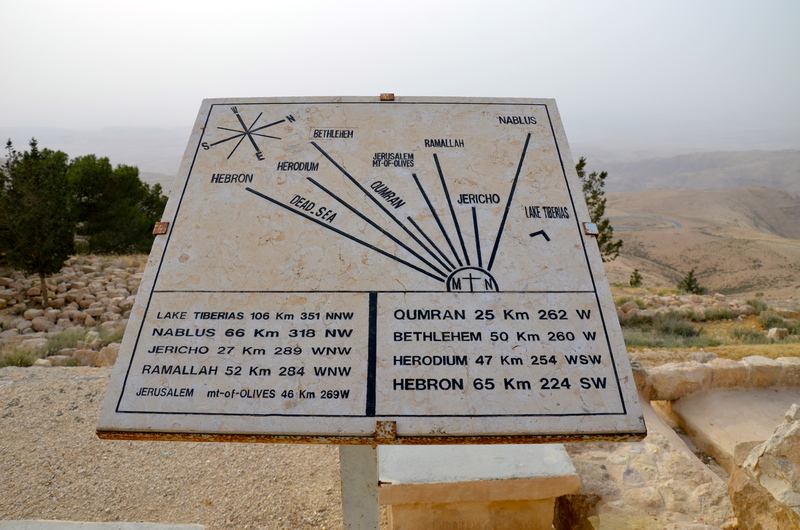 The map may partially have served to facilitate pilgrims’ orientation in the Holy Land. All in all, the map depicts about 150 labelled towns and villages. For me, perhaps the most exciting aspect of the map has been its use to locate and verify biblical sites throughout the holy land. For instance, in 1967, excavations in the Jewish Quarter of Jerusalem revealed the Nea Church and the Cardo Maximus in the very locations suggested by the Madaba Map. In February 2010, excavations further substantiated its accuracy with the discovery of a road depicted in the map that runs through the center of Jerusalem. According to the map, the main entrance to the city was through a large gate opening into a wide central street. Until now, archaeologists were not able to excavate this site due to heavy pedestrian traffic. In the wake of infrastructure work near the Jaffa Gate, large paving stones were discovered at a depth of 4 meters below ground that prove such a road existed. The mosaic also identifies significant structures in the Old City of Jerusalem: the Damascus Gate, the Lions’ Gate, the Golden Gate, the Zion Gate, the Church of the Holy Sepulchre, the New Church of the Theotokos, the Tower of David and the Cardo Maximus. What’ remains today of the mosaic map is amazing to see and I did take some photos of it that I hope to put on Facebook soon. As I stood there looking at it, it was hard to believe that such a detailed map existed during the time is was created. And again, to know that it substantiates some of the sites referenced in the bible is fascinating. As I left the City, I ran into one small shop and purchased a memento to bring home. The shop keeper and I exchanged a few words and he asked if I have enjoyed my visit. I told him I had and that he has a beautiful country. He replied that it was my country too. That sentiment was repeated over and over. 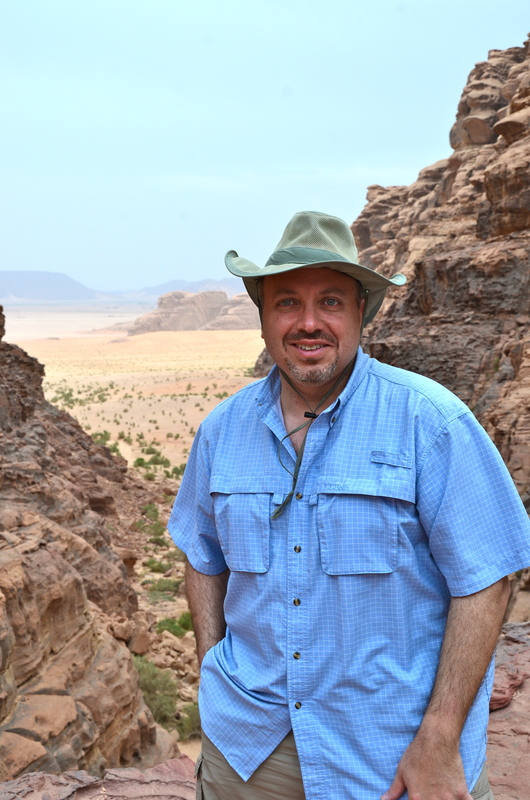 The kindness and hospitality of the Jordanians was clearly visible wherever we traveled. Our foreign assistance dollars this place have made a difference for the better of our two countries and that was exciting to see and hear. We left the hotel earlier today then we had all week. With our official meetings over, and my head filled with information and details, and my suitcase overflowing (and I’m sure heavier then the weight limit) with handouts, presentation materials, and books, we packed our bags and set out for the our four hour ride to Petra. We were just happy to get out of the bus. It was a pleasant enough ride and the accommodations were fine, the ride itself was slightly uncomfortable, bouncy, etc. But the trip was well worth the effort! What an amazing journey. From he first time I watched the Indiana Jones movie that featured Petra, I always wanted to visit this place. And it did not disappoint! At more than 2,000 years old, this city appears to be half as old as time itself and as you wonder through the old city streets, you cannot help but wonder what life here must have been like. This city is indeed one of the greatest archaeological treasures of the world. Tucked quietly in the mountains of southern Jordan, between the Dead Sea and the Gulf of Aqaba, Petra was once the strategic location along early trade routes between the Middle East and northern Africa. Its people were some of the original architects, artisans and tradesmen prospering until trade routes changed and the Romans eventually took over. Now a United Nations World Heritage Site, the eroded areas are protected for future generations to enjoy. The ancient main entrance to Petra was breathtaking. It was a 1,200 meter long (or 4,000 feet) deep and sometimes narrow gorge of stunning rock formations and artwork. Just when you think you’re done, there is another twist or turn, and then you come face to face with the iconic image of Petra, the Treasury, or Al-Khazneh. The main influence in the construction of theTreasury was Hellenistic and stands an impressive 141 feet tall, and 100 feet wide. We walked further through the city to see the Street of Facades and the city theatre. Scattered high above the streets and well into the mountain sides, you could see caves that were bored into the rock formation and acted as homes to local residents of the time. We also walked the colonnaded street, which was added after the city was incorporated into the Roman Empire. This street led through the city center and is flanked by temples, public buildings, and shops. It was absolutely breath taking. Petra is beautiful. It stands as a testimony to past civilizations, their desire for order, their commitment to education, and their passion for architectural and civil engineering dominance. Despite the fact that we walked through Petra for nearly two hours, archeologists estimate that only 20% of the original city has been unearthed and that Petra was once home to a thriving ancient city of 30,000 people. Although our day in Petra was perfect, the weather turned as we drove south to Wadi Rum, a huge desert reserve area in southern Jordan protected by the Jordanian government. Upon our arrival at the campsite, we were shown into a large square tented courtyard and offered teas, dates, and cookies. The area was laid out in a Bedouin-style, with rugs and cushions everywhere. We waited there until our rides were ready to tour Wadi Rum and head to our campsite for the evening. Wadi Rum is another amazing place seemingly frozen in time. We boarded two 4×4 pickups and bumped past titanic stone sculptures of Wadi Rum. The pickups stopped a few times to awe at the beauty of it all. At one point, I found my own piece of the desert to reflect at what God had created in this place. 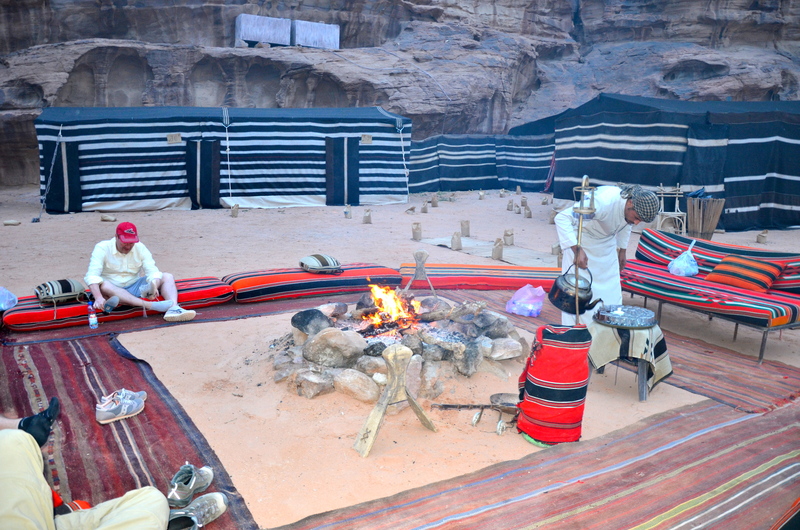 We arrived at our camp, fully set up in Bedouin style, and enjoyed tea, explored the area and got settled. 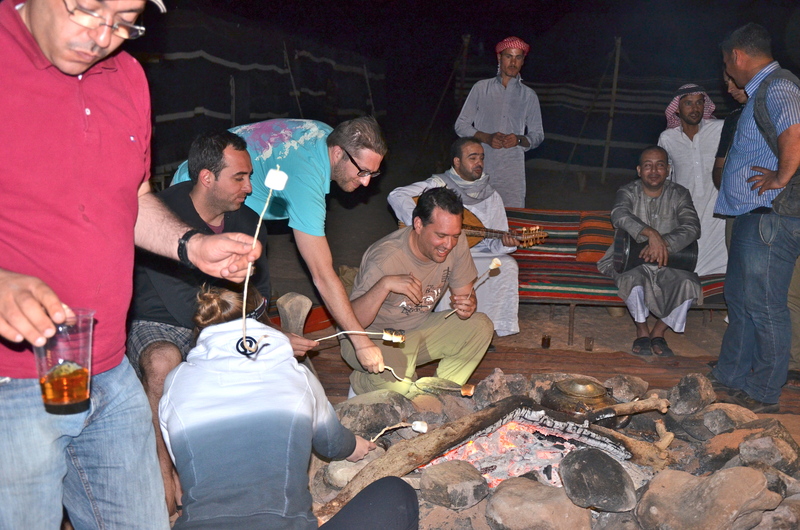 As we waited for dinner, we took the opportunity to introduce a western classic to our Bedouin and Jordanian hosts – s’mores! I’m not sure what they thought about our description of a s’more, but once they got the hang of, they seemed to enjoy the process and the end result. There is nothing like “S’more Diplomacy” to build relations around the world! The camp just housed our delegation, and there was dining, live music, dancing, great fellowship, and exploration. We watched as our hosts pulled our dinner out of the ground after cooking for hours beneath the sand. The meal included lamb, chicken, rice, and vegetables all cooked together. 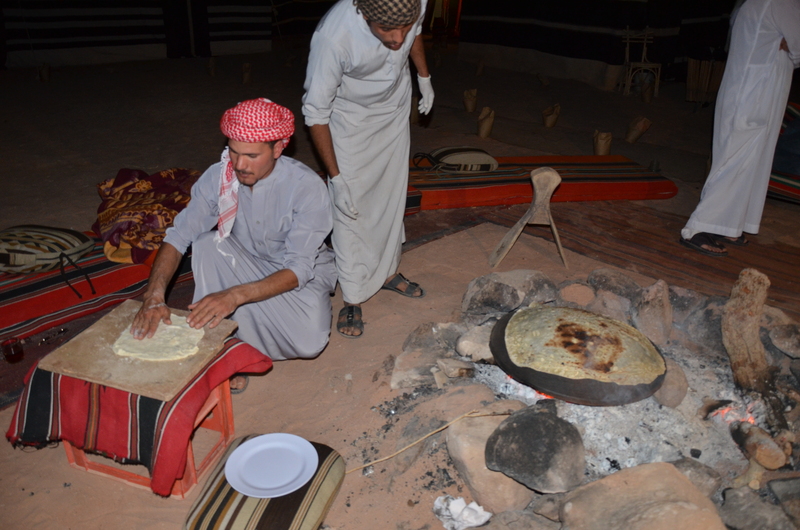 Our Bedouin host also made fresh bread he flattened and cooked on a heated inverted wok kept on the fire. Unbelievable! The hot dishes were served with an assortment of hummus, salads, and sauces. After things settled down, several of us decided to sleep under the stars instead of in our personal tents. At this point in my day, I would normally check emails, voice mails and send a dozen or so text messages, but none of that was happening this night. No phones, no computers, just the age-old art of conversation under intense and unblinking stars. Once everyone was in bed, I sat in our campsite and gazed at the rock formations surrounding our home for the evening and heard nothing. Nothing but my thoughts. For the first time in my life, I heard absolutely nothing. It was as startling as it was refreshing and peaceful. Just me, the earth and the air. I slept under the stars and awoke as soon as the sun began to rise and the formations around me were painted a different color than the night before and even more beautiful. Wadi Rum wraps its guests in a warm tranquil embrace that makes it difficult to board a 4×4 to head out of the park in the morning. 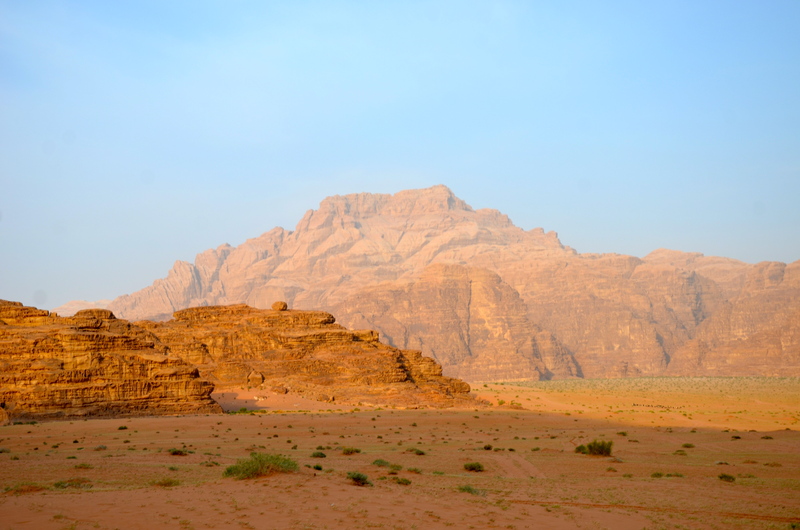 On Saturday, our last full day in Jordan, we left Wadi Rum to make our way towards the Dead Sea. Before checking into the hotel, we had one last antiquity in this amazing country peppered with antiquities and holy sites. We set out for a place knows as Bethany beyond the Jordan. For me, this may have been the most moving of sites visited during this trip. I truly felt that this was in some ways a part of my Christian journey and a pilgrimage of sorts. 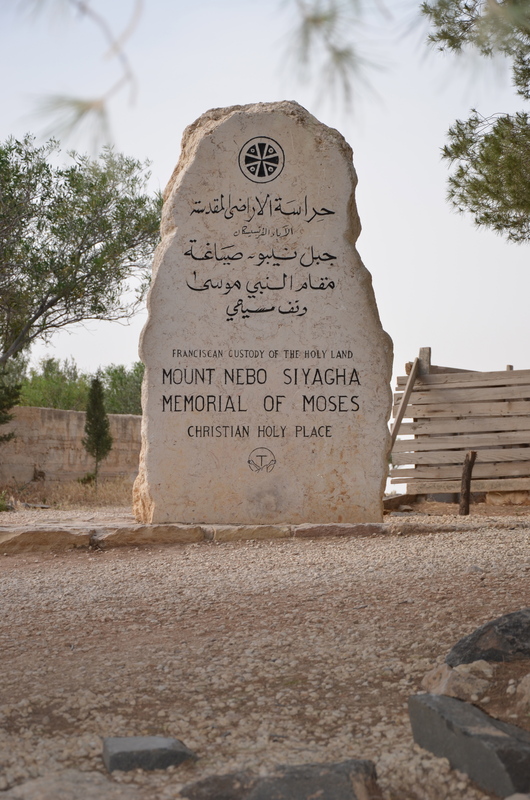 I didn’t think that when we set out, but by the end of the trip, visiting mount Nebo, Madaba, and this site were collectively overwhelming. I certainly acknowledge that no one today knows where Jesus was baptized, but we do know that John the Baptist hung out in this region of the Middle East. We know that Jesus and John were together at some point during John’s ministry and we know, from historical records and archeological finds that somewhere in the general region I was is indeed the place where John and Jesus connected together. To know that I was walking on this holy ground was moving, inspiring, and a bit overwhelming. The area I am talking about is about a 45 minute drive from Amman, and slightly north of the Dead Sea. For the three past year and a half, the Jordanian Department of Antiquities has systematically surveyed and partially’ excavated a series of ancient sites that collectively make up one of the most important archaeological discoveries in modem Jordan. 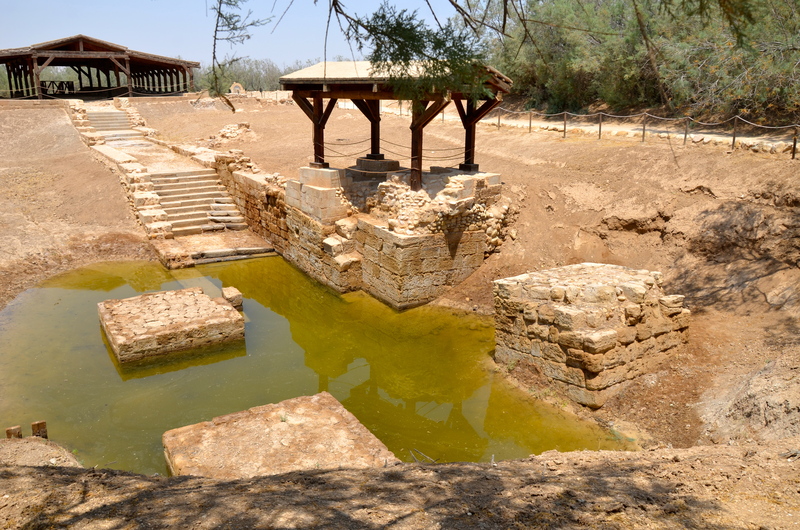 The site excavated reveals the settlement of Bethany, where John the Baptist lived and baptized. 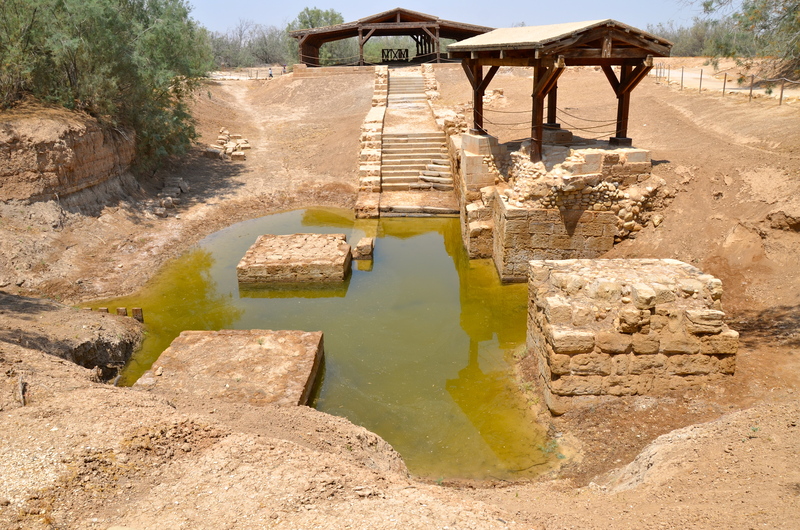 The Bethany area sites formed part of the early Christian pilgrimage route between Jerusalem, the Jordan River, and Mt. Nebo. Archaeologists believed they have unearthed the cave where John the Baptist lived and the area is also associated with the biblical account of how the Prophet Elijah ascended to heaven in a whirlwind on a chariot of fire, after having parted the waters of the Jordan River and walked across it with his anointed successor the Prophet Elisha. The Madaba map depicts two concentric circles at the site, which have variously been interpreted as symbols for the hill itself, the nearby caves, or the spring. The remains of a large church immediately adjacent to and east of the river include fine colored stone pavements and mosaics, Corinthian capitals, and column drums and bases, all from the late Byzantine period. 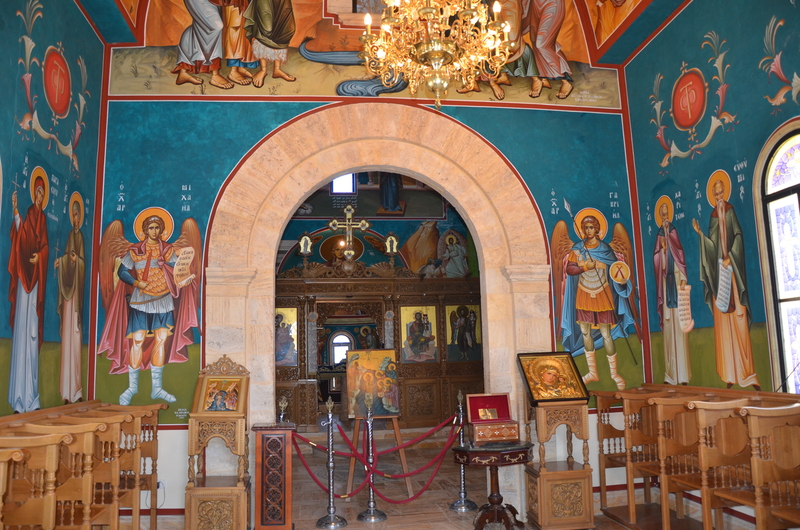 This church may have been built in the Byzantine period to mark the exact spot where people believed that Jesus was baptized and where John lived and preached his baptism of repentance and forgiveness of sins. This is the site that visited. 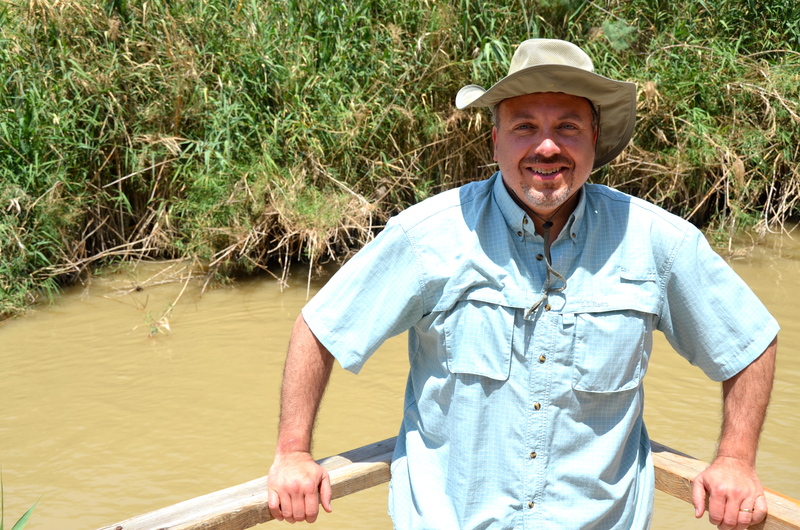 After visiting this ancient site, we went down to the Jordan River’s access point on the Jordan side of the river. 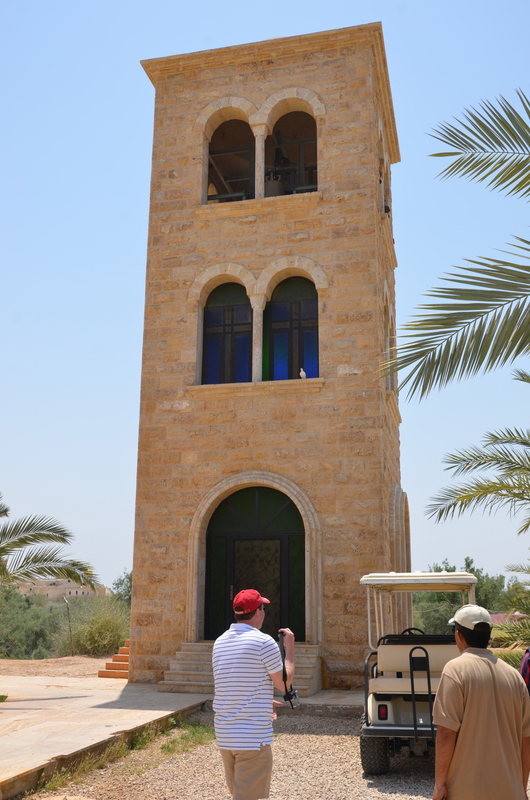 There we could see the Jordan River’s current day flow, and across the river – which could not have been more than 15 feet wide – we witnessed baptisms taking place on the Israeli side of the Jordan. Believers dressed in white robes were immersing themselves in the river at one entry point while beliefs from Ethiopia were being baptized slightly down river. 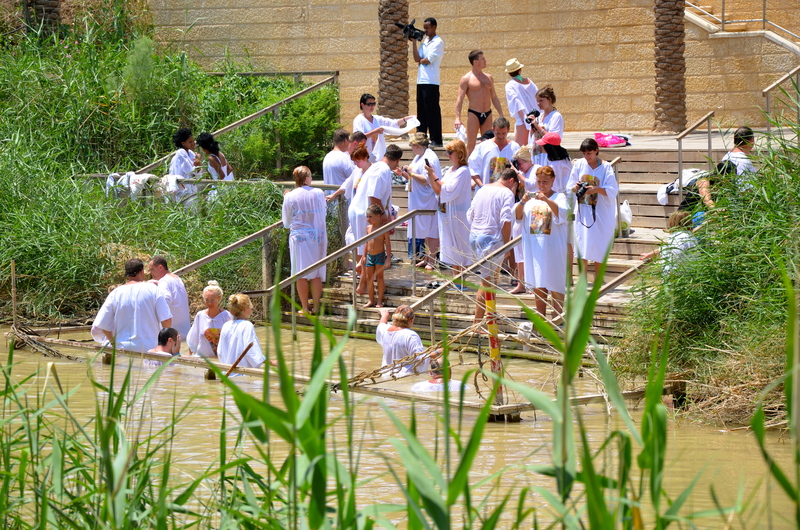 On the Jordan side, a group was gathering to celebrate the baptism of a newborn child in the Jordan. As we ascended the steps back up the embankment, we visited a small Greek Orthodox Church, the Church of John the Baptist, and entered the church to look around. The church was more of a small chapel than a church, but the mosaics, and paintings inside were beautiful, including the altar. I lite a candle and said a few prayers for some friends and family who I know are having a tough time and again, a second wave of emotion came over me. As we exited the church to head back to our bus, I looked up at the bell tower next to the church and saw three or four white doves perched in the tower. That was about all I could take at this place and whether or not this is the exact location of the baptism, it was one of those moments in one’s faith journey that is life-changing. It is a visit I shall never forget and it is one that will stay with me long after my return home. 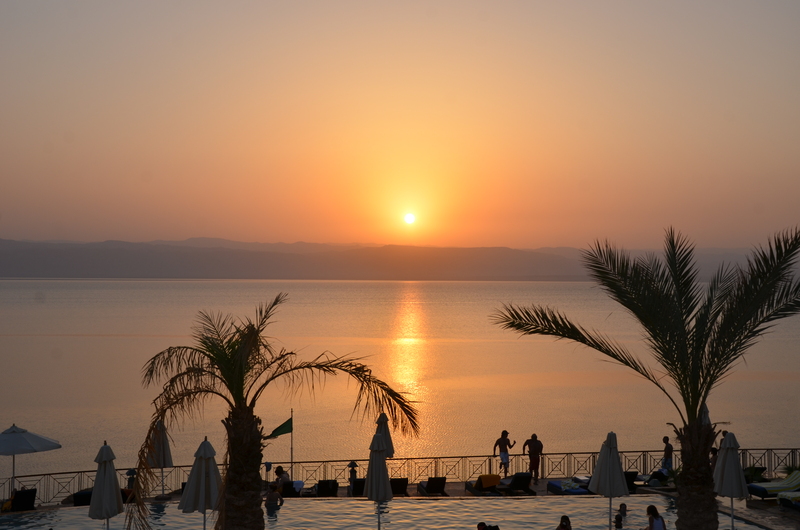 On our final night in Jordan, we stayed at a hotel on the Dead Sea. The temperature at this point had gone from pleasant most of the week, to extremely warm at this place. My walk to the beach was long and steep. 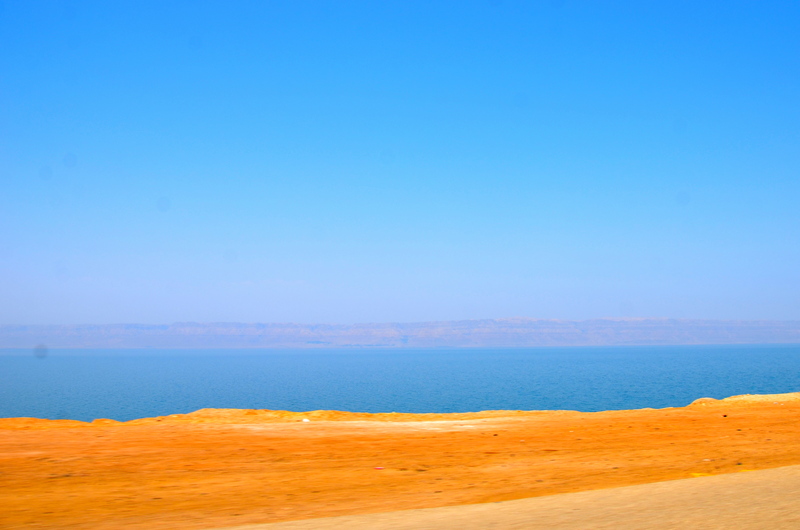 The Dead Sea is the lowest land point on earth. People travel from all over the world to slather themselves in nutrient-rich mud from the Dead Sea and to float in its salty and mineral filled waters. Legend says it was the Queen of Sheba who first believed in the mystical healing powers of this age old sea. Then Cleopatra traveled from Egypt to build the world’s first spa there, later sending her armies in place of her to bring back their precious minerals. I decided to walk into the sea and check this out. There was a warning sign at the entry point that stated one should not spend more than 20 minutes in the sea at a time. Not the signs we usually see in the US. “Watch for Rip Tides,” “lifeguard on duty,” and so forth. No, at the dead sea, just an ominous warning that too much exposure to the salt will harm you, so I guess 20 minutes or less is the right level for healing! My assessment….the water was warm, salty, and after just a quick walk in and placing my right arm in the water (presumably to heal a nasty bout of poison ivy that has been with me for two weeks now), I felt slimy and slippery. You can immediately feel the minerals in the water on your skin. I couldn’t wait to take a shower. But it did feel cool. By the way, my arm looked 50% better by the time I returned to my room – I guess the Queen of Sheba was onto something. I stood on one of the numerous balconies to watch one of the most dramatic sunsets I have seen. 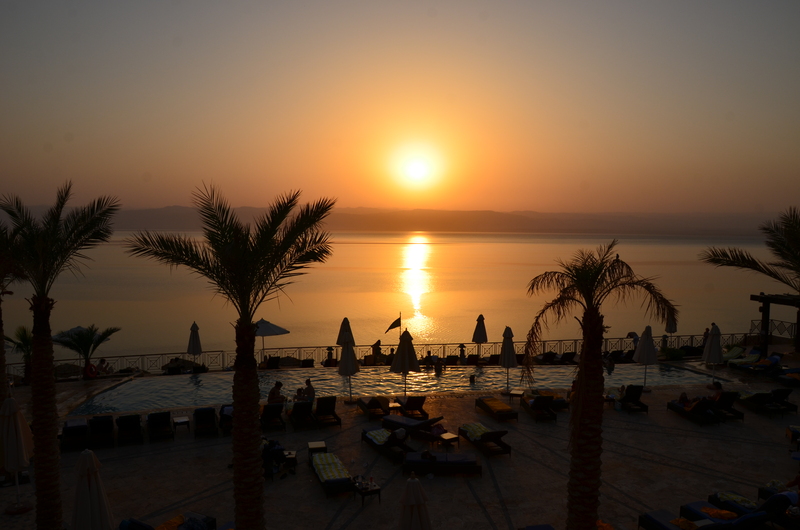 As the sun lower itself over the Dead Sea, I was happy over the thoughts of seeing my family again, but sad to see the sunset on this amazing journey through Jordan.